What Information Is Prioritized by Attention in Daily Life? How Do the Dynamics of Attention Prioritize Social Information? A Critical Period for Language Learning? Does Having a Conversation Partner Make Us Gesture? Does Thinking Hard Make Us Gesture? Gesture’s Role in Communication: Does Gesture Convey Information to the Listener? Gesture’s Role in Thinking: Does Gesturing Help Us Think? Do Infants Understand False Beliefs? Does Play Improve Developmental Outcomes? What Do We Want to Understand About Conceptual Development? 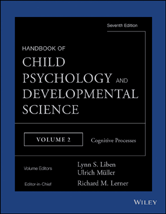 Quantitative or Qualitative Changes in Children’s Temporal Abilities?